First you should know that I call my mother “mama”. Yes, it’s true, I can admit it with no problem. I still call her mama to this day. She called her mother mama and my Grandma called her mother mama and Billy calls me mama. That’s at least four generations that I know of! I’m thankful that we have this sweet tradition. I think “mama” sounds more soft and tender than “mom” for some reason. I told Billy that he can call me “mom” in front of his friends so he can save face. But sometimes he forgets and I just kind of smile to myself! My mother always made meatloaf when we were kids. Whenever I eat it now, it takes me right back to being young and feeling comforted. My mother was a good cook and always made tasty, simple food. From a young age, I learned to cook by watching her in the kitchen. In fact, I wanted to cook so badly, that there are some funny family stories involving obedience, extensive sneaking around and potential kitchen disasters! Mama’s meatloaf was easy to make because she used a “McCormick” seasoning packet, which made it taste really good. I’ve included a option using your own spices as well so you can choose, since these packets tend to have just a few unidentifiable ingredients! Either way, your meatloaf should evoke feelings of comfort, that is if you’re from the “meatloaf generation”, which means you’re probably over 50! Put hamburger in a big bowl. Thinly slice 2-3 pieces each of onion and bell pepper for the top of your meatloaf. Then chop the rest into small pieces. 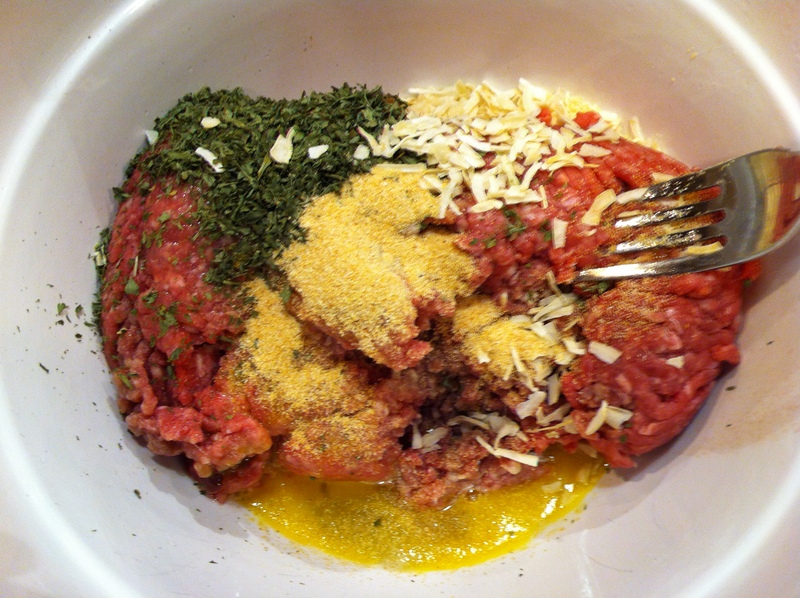 Add onion, bell pepper, eggs, oatmeal, parsley and packet or other spices to hamburger. Mix up this mess with your hands (if you can “handle” it-haha) or use a fork. Form meat into kind of a 1/2 football thing in a pan sprayed with “Pam”. Pour tomato sauce or drizzle ketchup over meatloaf (depending on how much tomato flavor you like). Place sliced onion and bell pepper on top. Bake for 45-60 minutes in a 350 degree oven. Serve with mashed potatoes and veggies. Enjoy! Be sure and check the inside of the meat before you remove it from the oven to make sure it’s cooked. It just kind of depends on how large you make your football!